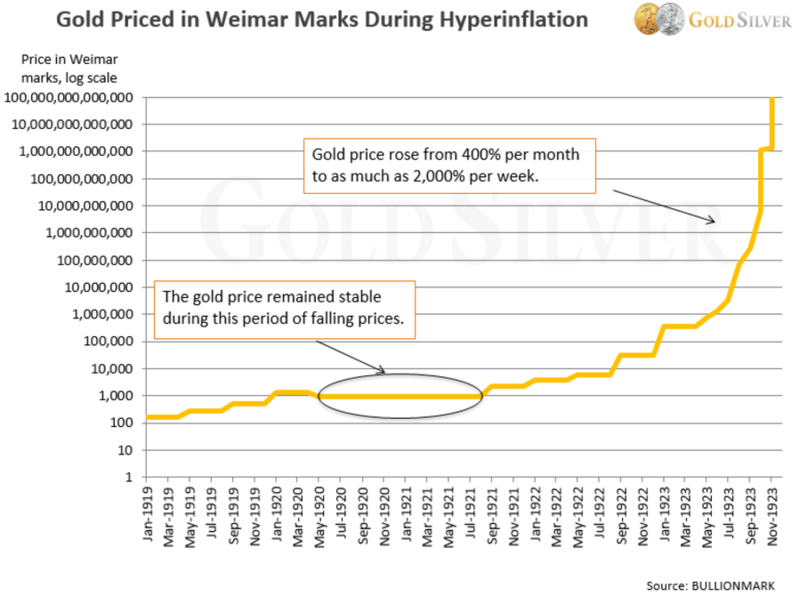 Gold as a Hedge Against Hyperinflation: Does It Really Work? One of the most frightening and personally devastating economic phenomena you can experience is hyperinflation. Unless you’ve lived through it, you have no idea of the havoc it can cause. The world’s seen it before many times. But since most recent examples have come from Zimbabwe, Iraq, Venezuela and other “third world” countries, the idea of it hitting the U.S. or Europe is often scoffed at. But is the idea really so crazy? After all, it’s also hit some of the world’s most powerful countries, within the last century, including China, Russia and Germany. Who’s to say it can’t happen to them again under the right (or wrong) circumstances? The first question most people have about this topic is: what exactly is hyperinflation? Definitions vary, but one of the more commonly accepted is an environment where consumer prices spike rapidly, rising at least 50 percent per month. It usually happens in the aftermath of the government increasing the currency supply substantially and/or the people losing confidence in that currency. The resulting price spike can quickly destroy one’s standard of living — but it can get a lot worse. And unfortunately, Mike Maloney — who famously predicted the 2008 real estate bubble and crash, among others — shows in the latest episode of his wildly popular Hidden Secrets of Money mini-series that most the world is simultaneously on a path remarkably similar to prior hyperinflations. Monthly pension checks were not enough to buy a cup of coffee. Banks closed at 11:00am due to a lack of cash to satisfy workers’ paychecks. Eventually, tellers went on strike and banks closed altogether. An insurance policy that had been faithfully paid for 20 years bought just one loaf of bread when it was cashed in. A factory worker reported that as soon as he was paid, he and other employees made a dash for the nearest shop and bought anything available. A student had to pay 5,000 marks for a cup of coffee. He ordered a second cup an hour later, but that one cost 9,000 marks. Petty theft became commonplace. Everyone was a potential target. Gasoline became unaffordable. Siphoning become commonplace. Rioting spread, and at its peak occurred daily. Politicians were protected before citizenry. Food shortages spread throughout the country. Starvation grew. Eventually, many people were laid off work. The majority of the population found themselves destitute. You can read the exact same accounts from other hyperinflationary periods, regardless of how prosperous the country or advanced the economy. While the Weimar Republic hyperinflation is perhaps the most famous modern example, it has happened throughout recorded history. The Roman Empire fell victim to hyperinflation in the third century A.D. when the government debased the coinage in response to money hoarding. The worst hyperinflation on record actually happened in Hungary post-World War II, with the daily inflation rate climbing past 200 percent — that’s more than 13 quadrillion percent annually. And more recently, Venezuela’s annual inflation rate seemingly increases by the day, having gone from 20.1 percent in 2012 to more than 45,000 percent by August 2018. If you’re not prepared, a hyperinflation can not only wipe out your savings but literally starve you to death. Is there really a way to safeguard your finances against such a devastating loss of purchasing power? Sure, gold is widely known as a hedge against inflation and market volatility. But does its value really keep up during hyperinflation? Do the benefits of gold continue to apply when the rules about inflation are seemingly thrown out the window? The historical record shows it does. Gold has not only matched hyperinflation rates but exceeded them. This rate of inflation is incomprehensible to most of us — even inflation spikes in the U.S. during the 20th century paled in comparison. It scarred virtually everyone who experienced it. So, what did the gold price do during that time? An ounce of gold traded for 170 marks at the beginning of that period. But by November 1923, one ounce sold for 87 trillion marks. Gold did what it’s supposed to do: its value skyrocketed during hyperinflation. Over the five-year period that included hyperinflation, the gold price increased 1.8 times faster than the inflation rate. In other words, not only did someone holding gold survive during the Weimar hyperinflation, their purchasing power actually increased by nearly double. Contrast that with the fact that most people's savings were completely wiped out. Even the wealthiest citizens were turned into poor ones literally overnight — except those that owned gold. But will we really see hyperinflation in the Western world? According to Hidden Secrets #7, famous economist Jim Rickards and Mike Maloney both agree that we’re on a path headed straight for it. Knowing what signs to look for will help you identify it before it happens. At the beginning of every hyperinflation, it looks like everything is okay. The economy is emerging from a crisis, usually a deflation or some kind of recession, and things are getting better. People feel more prosperous because the storm has passed and there’s more money around from the extra currency the government has printed. Markets like housing and stocks tend to rise. But it’s an illusion because prices have yet to adjust for all the extra currency that was created. Why does it have to adjust? Because inflation is not just the result of a spike in money supply, but also money velocity. In simple terms, this is a measure of how frequently currency changes hands. As citizens begin to feel better about the state of the economy, they spend more. That extra money now starts to enter the economy — and prices begin to move higher as it circulates more and more. Here’s a snapshot of what this time period looks like from Hidden Secrets Episode #7. As you can see, prices eventually catch up to account for all the extra currency that was created. And that sudden spike you see is the direct result of money velocity. Even though central bankers can control the money supply, they can’t control velocity. And since money velocity is largely a psychological phenomenon, it’s very hard to change it back once it takes hold. This is how inflation has historically gotten out of control and led to hyperinflation. So, watch for an increase in money velocity. Once that shift starts, the countdown to hyperinflation has started. A hyperinflation occurred 55 times in the 20th century. Since Weimar Germany, there has been a hyperinflation, on average, every three years. Since the year 1500, approximately 25 percent of the 617 currencies that went to zero was a direct result of hyperinflation. It is not such a rare event. 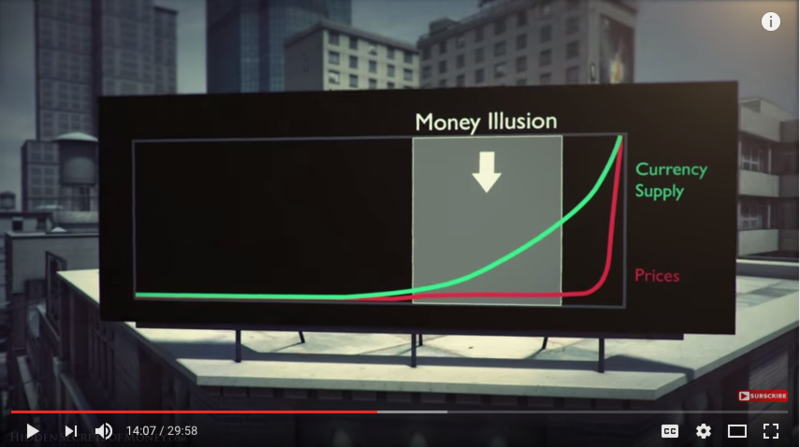 As Mike shows in his newest video, we are on a path that will end in currency destruction. Even though it doesn’t feel like it now, be careful of the money illusion. The actions central bankers have taken and continue to pursue are the same ones that history shows have led to hyperinflation. It is critical you prepare now. Don’t think you can just buy gold then — it’ll be too late. Bullion will probably not be available on a wide-scale basis, and if it is will be wildly expensive with astronomical premiums. You need to buy gold and silver as a hedge against inflation now, before a hyperinflation kicks in. Will you be on the losing end of the upcoming wealth transfer? Or will you be part of the new rich? Watch Episode 7 of Hidden Secrets of Money and see how you can position yourself for the opportunity of a lifetime.